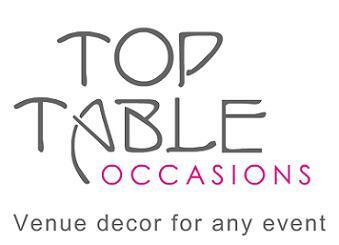 Top Table Occasions specialises in offering a bespoke venue decoration service for any occasion. We provide venue décor including chair covers and bows, table linen, centrepieces, floral arrangements and much more to transform your venue. We specialise in decor for all occasions including Weddings, Receptions, Anniversaries, Parties and Corporate Events. It’s your day, so your decisions are the ones that count. We’ll work closely with you to put together a personalised package that will suit you best so you are confident in the choices you’ve made. We’ll make your venue look beautiful, elegant and most of all memorable.